Judging from the phone calls we’re receiving today our customers are quite rightly concerned about the Rasomware attack highlighted at the weekend by the shutdown of services at the NHS. There is a lot of talk in the media about what you should and should not do so I thought a bulletin from Amanet may help. Friday’s attack is on track to be one of the biggest recorded ransomware attacks ever, with tens of thousands of infected computers in nearly 100 countries. The attack largely hit businesses and large organizations: UK hospitals, a Spanish telecom, FedEx, the Russian Interior Ministry, but there will be many smaller organisations also waking up to today with systems that are effected. Ransomware is a type of malicious software that takes over a computer and locks the user out, preventing them from accessing any files until they pay money. This particular program, called WannaCry, asks for about $300, though the price increases over time. WannaCry takes advantage of a Windows flaw discovered by the NSA and made public by hackers in April. Microsoft released a patch for the vulnerability in March. Computers are primarily infected by users clicking on links or attachments that covertly install the ranomware. So what can you do to protect yourself from ransomware? Users should also be vigilant in relation to email and not open any links or downloading attachments in emails from unfamiliar or possibly suspicious sources. Software, apps and other programs should never be downloaded from unofficial sources as this is another common method for hackers to secretly install malware onto computers. Make sure your computer software is always up to date. Make sure you systems are being backup. Make sure you have antivirus programs installed and that they are up-to-date. Organisations and employees, must start to think pro-actively about how to protect themselves from ransomware. For ransomware to work, hackers need to download malicious software onto a victim’s computer. This is then used to launch the attack and encrypt files. The most common ways for the software to be installed on a victim’s device is through phishing emails, malicious adverts on websites, and questionable apps and programs. People should always exercise caution when opening unsolicited emails or visiting websites they are unfamiliar with. Never download an app that hasn’t been verified by an official store, and read reviews before installing programs. 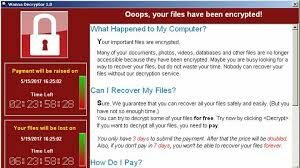 The greatest damage people suffer from a ransomware attack is the loss of files, including pictures and documents. The best protection against ransomware is to back up all of the information and files on your devices in a completely separate system. A good place to do this is on an external hard drive that isn’t connected to the internet. This means that if you suffer an attack you won’t lose any information to the hackers. Antivirus programs can stop ransomware from being downloaded onto computers and can find it when it is. Most antivirus programs can scan files to see if they might contain ransomware before downloading them. They can block secret installations from malicious adverts when you’re browsing the web, and look for malware that may already be on a computer or device. Victims of ransomware attacks are advised to never pay the fee as it encourages attackers and in our experience has never resulted in files being recovered. If you have a back up, you can restore your device from that.